. 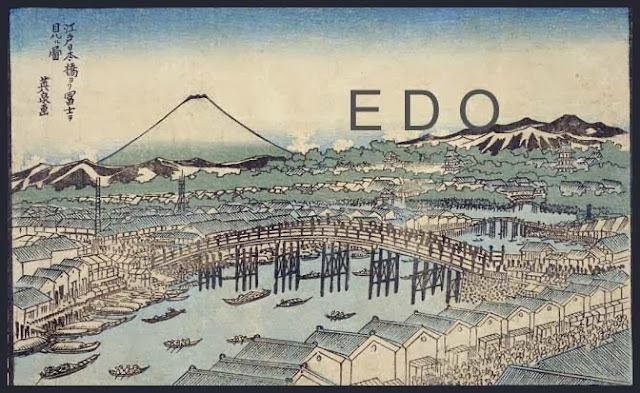 Persons and People of Edo - Personen . Located in the North of the Uenodai plateau. beyond the gake 崖 cliff of the plateau 上野台 Uenodai. Below was the kishi/gishi 岸 shore line looking garbled like ne 根 roots of trees. 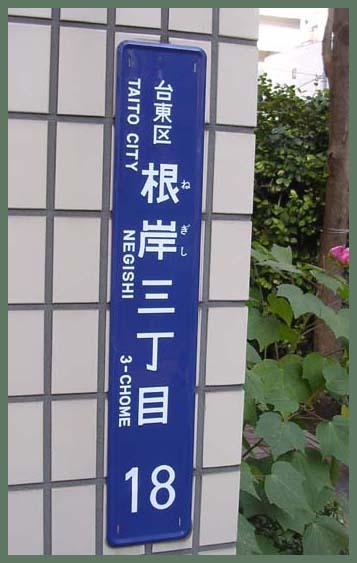 武蔵国豊島郡根岸村 Negishi village in the Toshima district of Musashinokuni. In the Edo period, it became part of 武蔵国豊島郡金杉村 Kanasugi mura village. It was a rural district with uguisu and kawazu 蛙 frogs and many people of good taste lived here. It had something special for any season. A Saijiki of 1838 mentions the voice of the first uguisu 鶯 in Edo and Negishi is one of the areas.
. uguisu no hatsune 鶯の初音 first call of the nightingale . A legend from 1670 tells of a priest from Kyoto, Hieizan, who came all the way to hear the voice of the nightingales. But the shy birds from the forests in Ueno did not sing for him. So he went back to Kyoto and asked 尾形乾山 Ogata Kenzan to gather about 3500 nightingales from the forests around Kyoto and bring them to Ueno. The birds were set free in Ueno and soon the local birds were able to sing just as beautiful as their friends from Kyoto. Ogata Kenzan 尾形乾山 (1663–1743), potter and painter.
. Minowa　三ノ輪 / 箕輪 Minowa district .
. Yanaka - 根岸谷中辺絵図 Negishi Yanaka Map . The pine was in the temple Saizo-In with a hall for 不動堂 Fudo Myo-O. 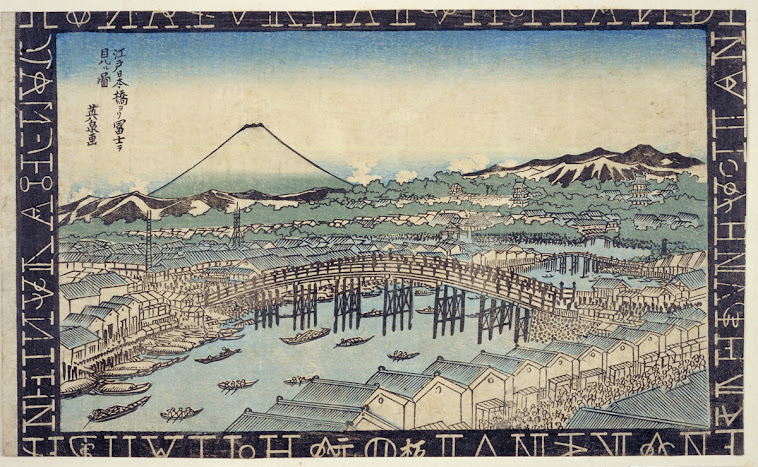 The first O-Gyo no Matsu must have been quite famous, since it is depicted in the Edo Meisho Zue and by Utagawa Hiroshige. In 1925, this pine became a 天然記念物指定 national treasure. At that time it was about 14 m high. In 1928, the tree withered and died, so the national treasure position was revoked. It must have been more than 350 years old at that time. In 1956, the second pine was planted, but it soon withered. In 1976, a third pine was planted and right by its side a bonsai-version of a pine was also planted to give the local people more incentive to look after its well-being. the statue of Fudo Myo-O was carved from the roots of the first pine.
. pine 松と伝説 Legends about the pine tree . Now 8代目桂文治 Katsura Bunji in the 8th generation lives here.
. 東叡山寛永寺 Ueno Tōeizan Kanei-Ji . In November 1820 a couple went to 東叡山根岸の弁才天の祠 the Benten shrine in the compound of the Kanei-Ji (Negishi). That night one of their man-servants had a dream of a toad. The toad said it lived under the kitchen sink and was 癩蝦蟇 Kattai-gama, leprosy toad. It said the mistress had violated the rules of the shrine visit and next night a serpent would come for revenge. But the Toad would protect them. Next morning when they looked they found a large dead toad under the sink. The next night the toad appeared in the dream of the master. It said: "I have died but I left enough children to keep protecting you!" Then following night the serpent appeared in his dream and said: "From now on, I will also protect your home and family!"
. gama 蝦蟇と伝説 Legends about toads .
. hebi 蛇と伝説 Legends about snakes and serpents . the simple abode of the retired poet in Negishi . Floor boards which rub together when walked on to produce a pleasant and delicate sound. This type of board flooring was used in the corridors, rouka 廊下, of some shrines jinja 神社, temples tera 寺, and palaces kyuuden 宮殿. When the floor boards are dry the sound occurs naturally. However, from the early 17c onward, techniques were developed purposely to produce this sound in order that a person's approach would not go undetected. It was one of many methods devised to prevent the possibility of insurrection. 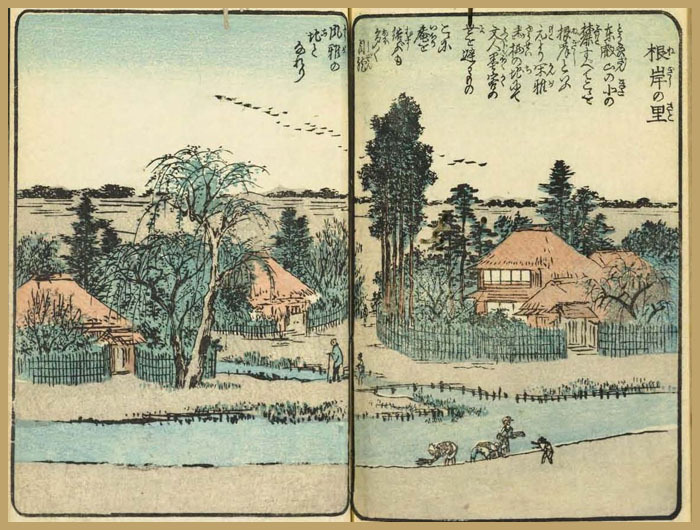 Perhaps the most famous extant example is in the Nijoujou Ni-no-maru Goten 二条城二の丸御殿 (17c), and the Chion-in Hondou Mieidou 知恩院本堂御影堂 (1619), both in Kyoto. The corridor running along the rooms in the Ninomaru Palace has a specially constructed floor that makes a sound like that of a nightingale when you walk on it. This corridor is known as the Uguisu-bari corridor. This construction is actually an alarm system because it generates sound whenever anyone walks on the floor of the corridor, warning of the presence of an intruder even at night. 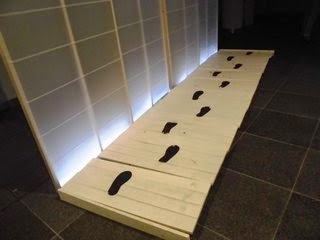 The floor contains special fittings and clamps, called mekasugai that generate the sound. There are a countless number of these clamps (about 12 cm long) located between the beams that support the floorboards of the corridor. There are two spike holes in each of the clamps and each hole has an iron spike in it. When someone walks on the corridor above a clamp, the clamp moves up and down causing the spike to rub against the clamp, producing a sound like the cry of a nightingale. Incidentally, the Daihojo Hall at Chionin Temple, employed by the Tokugawa family for official affairs, has an Uguisu-bari corridor similar to that at the Ninomaru Palace. 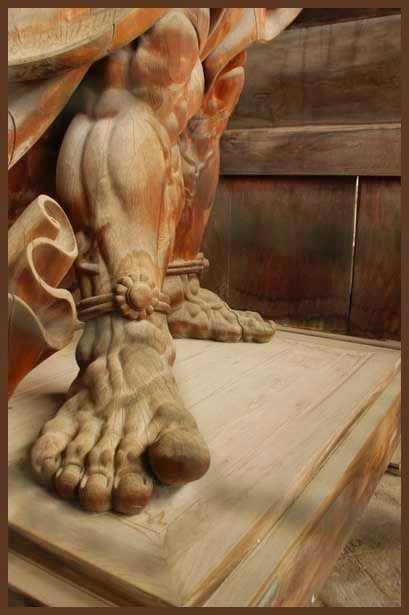 with bare feet . . .
. WKD : hadashi 跣足 (はだし) barefeet, barefoot .
. Japanese Architecture - Interior Design - The Japanese Home . A Edo period communal living room usually containing a hearth *irori 囲炉裏 and often situated close to the earth-floored area *doma 土間. Its character and use varied according to the scale of the structure. In relatively large residences of middle ranking warriors or leading farmers and merchants, chanoma was principally used by the women of the household or by female servants as a kind of common room, where meals were taken, some food prepared and informal conversation took place around the hearth. In the Kansai 関西 region in particular the term was often used to refer to the maidservants' room. In smaller residences chanoma was often used interchangeably with *ima 居間 or *daidokoro 台所 to refer to the principal communal living room. In north eastern Japan, along the Japan Sea coast from the prefectures of Niigata to Shimane, in Shikoku 四国 and in parts of Nagano prefecture, the term was used in traditional vernacular houses *minka 民家 to refer to a large room adjacent to, and often opened to, the earth-floored area. Usually the room contained an hearth around which the family gathered for meals. The chanoma was often open to the rafters, allowing smoke to escape through a smoke hole *kemuridashi 煙出 in the roof. Originally the floor was exposed timber boarding without mats *tatami 畳. Also, the family's Shinto and Buddhist altars *kamidana 神棚 and *butsudan 仏壇 were often located in this room. A café featuring a 21st century depiction of tea ceremony rooms. The café has a lounge and dining area fusing oriental and occidental essences. ochanoma ryūgaku お茶の間留学 "study abroad from the living room"
Nova is a large eikaiwa school (private English teaching company) in Japan. As our lifestyles have changed, some languages have also changed. A Japanese term “cha-no-ma” is one of them. "Cha-no-ma", literally means “the space of tea”, referrers to a place where family members get together to chat, eat and relax. That is, a living room. I am not sure about its origin of the word, but in a good old days, when family members spent time together in the same place, tea was always there. “Cha-no-ma” is a nostalgic word associated with cozy and relaxing time in a large family. Now, the time has changed. The family is smaller, and we live in busier society, and hustle and bustle of life. Eventually, the term of "cha-no-ma" is on its way out. We call the room “ima (literally, existing room)” or “living room” nowadays. But still, whatever the term is, whatever the size of family is, spending time together among family while having tea will make us mellow out, always. 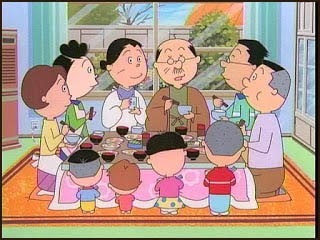 Sazae san family sitting in their "cha-no-ma"
The nephew of Takahama Kyoshi 高浜虚子.
. kirizanshoo 切山椒 sweet desert dish . A kind of sweet made from rice flour, sugar and mountain pepper. It can be cut and served over a bowl of rice for a quick snack. It is usually served steamed, which enhances the fragrance of the pepper. 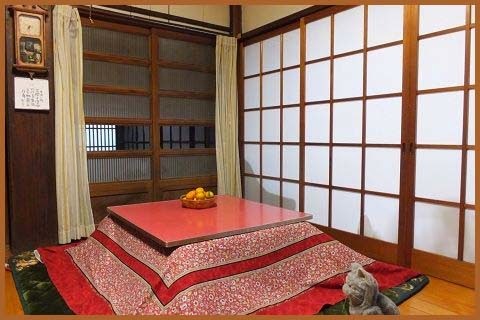 It is supposed to brick luck with money affairs.
. okigotatsu 置炬燵 kotatsu table to put on the floor .
. - Doing Business in Edo - 商売　- Introduction . kugi 釘 A nail made of metal, wood or bamboo and shaped according to use. Traditionally, metal kugi are square, kakukugi 角釘. However there are a great variety of other kugi: flat nails hirakugi 平釘; double pointed bent nails aiorekugi 合折釘; double pointed nails aikugi 合釘; twice bent end nijuu orekugi 二重折釘, a thrice bent nails inazuma orekugi 稲妻折釘; and a bag hanging nails fukurokakekugi 袋掛釘. Also kurekugi 呉釘, kirikugi 切釘. A straight nail with both ends pointed. It is made of wood, bamboo, iron, or bronze and used to join wooden boards. Some are round in cross section and others are square kakuaikugi 角合釘. Note that maruaikugi 丸合釘 refers to a Western type nail, and not a round aikugi. Also called oreaikugi 折合釘 or mageorekugi 曲折釘. A type of double-pointed iron nail, square in section, and bent into an L-shape. Used to attach the frames of opaque paper sliding screens fusuma 襖, to a skeletal framework, hammered down so that they are not visible from the exterior. Aiorekugi typically are spaced about 21cm apart. Lit. morning glory nail. A two-pronged nail bent into a right angle for the purpose of hanging a flower vase. 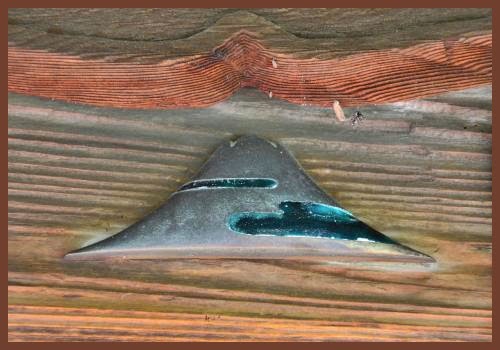 The nail usually is driven into the bamboo lath of a vine-laced, lattice-reed window shitajimado 下地窓, or on the lath of a small window hana-akarimado 花明窓, found at the side of the tea house alcove tokonoma 床の間. The points of this nail are bent around the bamboo lath of the window lattice after it has been pounded in. Typically, morning glories 'asagao 朝顔', are displayed in this vase hence the name, but sometimes other flowers are displayed. fukurokakekugi 袋掛釘 Lit. bag hanging nail. A bamboo or iron nail inserted into the middle post nakabashira 中柱, of a tea ceremony room. It is used to hang up the tea caddy bag, shifuku 仕服. The nail is bent to form a hook with the under part being bent at a right angle and rounded to make it easy to hang up the bag gracefully. A small guard regulates how far the nail is to be hammered into the post. The nail is positioned about 11cm above the horizontal wooden piece which holds the extended sleeve wall sodekabe 袖壁, and terminated by the nakabashira. This prevents the bag from touching the floor. Example: Kohouan 孤篷庵 Daitokuji 大徳寺 (rebuilt by Matsudaira Fumai 松平不昧 flourished ca. 1800), Kyoto. A nail used to hang a flower vase in a tea ceremony room chashitsu 茶室. Some are hammered into the center of the alcove tokonoma 床の間, wall and others are hammered into the alcove pillar tokobashira 床柱. The former is also called nakakugi 中釘 and the latter hashirakugi 柱釘 or tokobashira hanakugi 床柱花釘. All are metal nails, bent up into an L- shape to form a hook. Also nijuu orekugi 二重折釘. A twice bent nail that is used under the ceiling molding or under the attached lintel for hanging scrolls. They are created by first bending them 90 degrees and then a second time. If set in a channel, musou shibuichi 無双四分一, nails of this type can also be moved to the left or right and are also used for hanging scrolls in an alcove. In this case, they are called inazuma hashirikugi 稲妻走釘 (running right angle hook). The bottom part is inserted through the opening in the web of the channel, and the prongs are bent so that they hang on the edges of the web. When a pair or set of three scrolls are hung, these special nails can be slid to the position needed. jikukakekugi 軸掛釘 / Also jikukugi 軸釘, kakemonokugi 掛物釘. A hook for hanging scrolls kakemono 掛物 that is made of metal or bamboo and hammered into the upper part of the back wall, or the bottom edge of the ceiling molding of a tea ceremony alcove tokonoma 床の間. Metal jikukakekugi are bent twice to form a three-pronged, trident shape. If made of bamboo, the hook is hammered straight into the wall, or with a slight upward incline in a rustic style tea ceremony room. Bamboo nails are 0.63cm long and are nailed 2.8cm below the ceiling molding, projecting from the wall. Around the late 16c - early 17c, in shoin 書院 style tea rooms one, three, four or eight scrolls were hung and each had a hook. When three hooks, mitsukugi 三ﾂ釘, were used, the right and left ones were made smaller and projected 3cm. When a set of three scrolls, sanpukutsui 三幅対, were hung, in a large shoin style room, a board 6-8mm thick, 12-30cm wide and 180cm long was nailed to the bottom edge of the ceiling molding and a groove was made so that the inserted zigzag shaped nails could be moved easily. Also written 皆折釘. A large, square, angular nail used for wooden or bamboo fences. Its head is bent at right angles but has a gable-shaped top. It varies from 8-9cm to 20-30cm long. Also musou orekugi 無双折釘. A type of nail used to hang a scroll in an alcove nakakugi 中釘. A nail which is composed of two parts: a sharply pointed tip and a second part which is bent up at a right angle to form a hook. The pointed part is securely driven into the plastered wall of an alcove and the latter part can be inserted into a fixed pocket and removed at will. This type of nail prevents damage to the scroll. It may also be used to hang a flower vase. 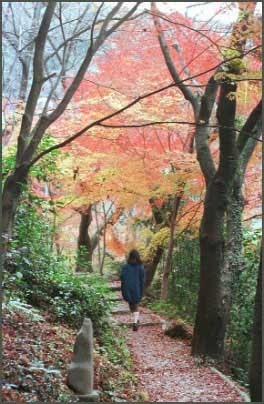 Also hanakugi 花釘, tokonakakugi 床中釘 (see orekugi 折釘). A nail hammered into the center of the back wall of an alcove tokonoma 床の間, on which to hang a flower vase or a scroll in a tea ceremony room. The nail is bent in such a fashion that when it is driven into the wall the back of the scroll is not damaged. Most nakakugi are placed about 1 m above the surface of the straw mat tatami 畳, but this distance varies widely, usually from 90cm-150cm, depending on the height of the ceiling. Also called kakemonokugi 掛物釘. A type of hooked nail orekugi 折釘. A square, double-bent nail that is used to hang scrolls kakemono 掛物. The nail head forms a ' コ' shape. A nail with three bends is called sanjuu orekugi 三重折釘. An archaic term for taru-no-kuchi 樽の口. Also called kanimekugi 蟹目釘 or noshigashira kugi 熨斗頭釘. A large, half-dome-shaped nail similar to a present day rivet. The WAMYOUSHOU 倭名抄 describes it as a large, high-headed nail, kashiradaka ookugi 頭高大釘. 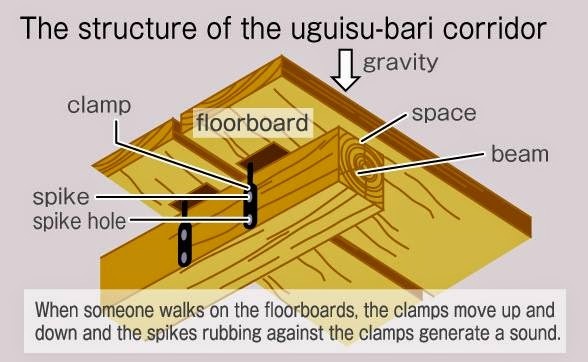 It is used to secure a gable pendant, gegyo 懸魚 or a non-penetrating tie beams, nageshi 長押. orekugi　折釘 A type of hooked nail made from one piece of iron. It is bent at a right angle and is square in cross section. The name is a corruption of orikugi 折釘. 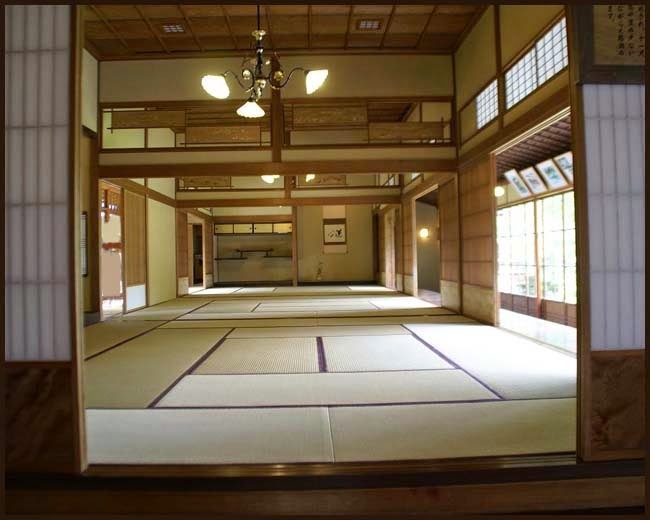 Orekugi are used for both the interior and exterior of a tea ceremony house *chashitsu 茶室. 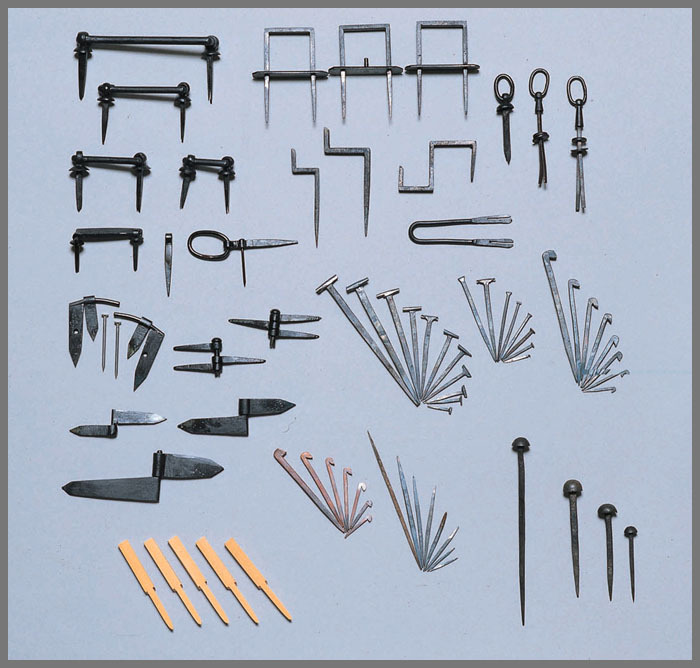 There are many different sizes and most have stops or guards which determine the extent to which the nail can be inserted into a wall, post, or molding. Orekugi are named according to their placement, or purpose. There are many types of bent nails. These include: fukurokakekugi 袋掛釘; musoukugi 無双釘; asagaokugi 朝顔釘; *tokobashirahana kugi 床柱花釘; tokonakakugi 床中釘; tokokakenaka kugi 床掛中釘; and tokootoshikake kugi 床落掛釘. 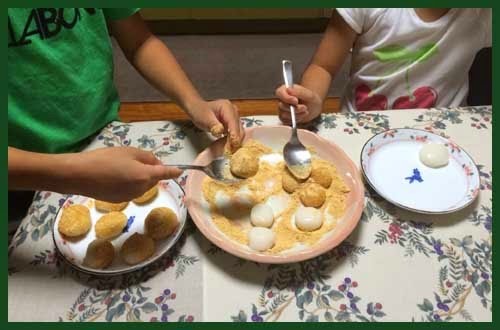 these Chimaki dumplings . . .
. Chimaki 粽 dumplings for the Boy's festival, May 5 . A nail that is bent in three tines at a ninety degree angle. Like the twice bent nail, nijuu orekugi 二重折釘, it is used to hang various kinds of decorative objects. Also called *inazuma orikugi 稲妻折釘. Usually the nail is 7.5mm square and made from giant bamboo, madake 真竹 (also nigatake 苦竹). They have a hook on which to hang scrolls and are used in a small room or alcove, tokonoma 床の間. When pounded into a wall, the nail project 27mm with the exterior skin on the upper side. Kobori Enshuu 小堀遠州 (1579-1647) and Kanamori Souwa 金森宗和 (1584-1656) preferred nailing takekugi into a wall with the exterior skin on the under side. Hooked bamboo nails were used in a tea ceremony houses, chashitsu 茶室, kitchen, mizuya 水屋, for hanging up towels used to wipe tea implements. Bamboo nails made from a smaller variety of bamboo that has a smooth surface with non-protruding joints are used by cabinet makers. Once shaped as nails, they are roasted in an iron pot and therefore have a brownish color. 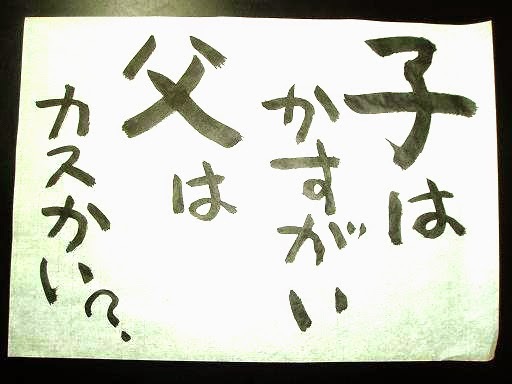 tokonakakugi 床中釘; tokokakenaka kugi 床掛中釘; and tokootoshikake kugi 床落掛釘. Also hanakugi 花釘. A nail on which a flower vase can be hung. 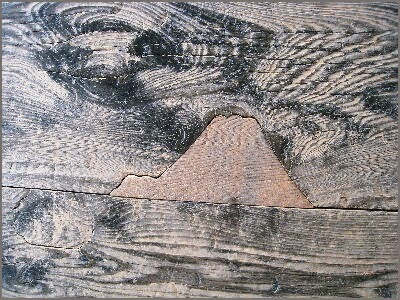 It is nailed onto an alcove post tokohashira 床柱 in a tea ceremony room chashitsu 茶室. Opinion varies on its proper position which ranges from 33cm below the alcove lintel otoshigake 落掛, to 97cm above the straw mat tatami 畳 floor. Also called nihonkugi 日本釘. A square nail used during and after the Tumulus period (CE 300-538/552). 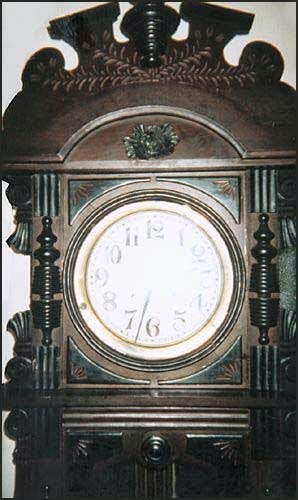 The nail was made of hand-wrought iron and was from 3cm-60cm long. Wakugi were classified by the shape of the nail head. The oldest nail of this type had a square head. Other heads were flat or spiral in shape. The nails were used to secure roof tiles yanegawara 屋根瓦, to eave ends, *nokisaki 軒先. Double pointed nails were used to join two wooden members to make a line like a seam, nuime 縫目. This method appeared during the Heian period (794-1185). At the Houryuuji Gojuu-no-tou 法隆寺五重塔, 27 different types of nails have been identified, ranging in length from slightly over 3.03,to over 60.9. Also yanagikakekugi 柳掛け釘. A nail hammered into a partially plastered post yanagibashira 柳柱 (see youjibashira 楊子柱), usually found in a 4 1/2 mat tea ceremony room chashitsu 茶室. The nail is hammered into the upper part of the post (the unplastered part) and a hanging flower vase is hung from it. According to Sen Soutan 千宗旦 (1578-1658) the nail gets its name from springs of willow draped from the nail at New Years. Examples can be seen at Yuuin 又隠 at Urasenke 裏千家, and Onigawara-no-seki 鬼瓦席 at Koudaiji 高台寺 both in Kyoto.
. kasugai 鎹 / かすがい clamp, cramp, cleat, staple .
. yanefuki 屋根葺き roofer, craftsman making roofs . deru kugi wa utareru 出る釘は打たれる "A nail that sticks out will be hammered"
deru kui wa utareru 出る杭は打たれる "A stake that sticks out will be hammered"
. The nail that sticks out . . . .
A wooden stake or post driven into the ground. 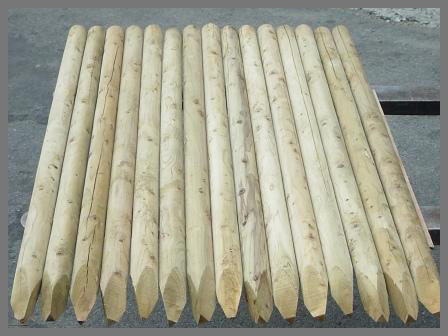 Closely placed round wooden posts, often shaved to a point, pounded into the ground to form a base that can transfer the down bearing load from the superstructure through the footing, sills, or foundation to the ground. This system has been used from very ancient periods for foundation ground work. Pine logs were most common, but Japanese cedar, sugi 杉, and evergreen oak, kashi 樫, were also used. The stakes had to reach down below the water table, as they decayed if they dried up. In order to strengthen the tip of the kui when driving into hard ground, a protective metal band called a pile shoe, kutsukanamono 沓金物, was sometimes added. Any upright pole or post added to the inside of a castle wall for extra support. While hikaegui increased the strength of the wall, they did make it more difficult to move around close to the wall on the interior because the light was dim and people could easily fall against these protections.
. Kokubunji 国分寺 Kokubun-Ji .
. kugi 釘 伝説　Legends about nails and curses . the lodging house in spring.
. Yosa Buson - Collection - 蕪村句集 Kushu . An ornament used to conceal the head of a large nail on a pressing tie rail *nageshi 長押 and on doors. Made of wood, copper, iron, or gilt bronze. From the Momoyama period techniques of cloisonne *shippou 七宝, inlay *zougan 象嵌, and openwork *sukashibori 透彫, decoration were used, and new materials such as ceramics were introduced. Pre-10c kugikakushi were hemispherical in shape and known as *bai 唄, manjuu kanamono 饅頭金物 (see *manjuugata 饅頭形) or *chichikanamono 乳金物. From about the 10c, kugikakushi were designed using a circle of flower-petal shapes. The most common types were the four-petalled *shiyou 四葉, six-petalled *rokuyou 六葉, and eight-petalled *hachiyou 八葉. They consisted of a central projection *taru-no-kuchi 樽の口 (cask plug), a round body *kikuza 菊座, and surrounding petal shapes *zagane 座金. Colored in various hues, these pieces are thought to be reproductions of nail covers with inlaid cloisonné. The attributed artist Ninsei (also known as Nonomura Seiemon, d. 1694), the prominent Kyoto ware ceramicist of the latter half of the seventeenth century, was a master in the technique of overglaze enamels. Although these small pieces have no identifiable stamp or inscription, the variegated paints of gold, silver, red, blue, and green, demonstrate the features of Ninsei's Omuro ware. Moreover, considering that these pieces came from the Marugame Kyôgoku clan, which is known for its rich collection of Ninsei works, it appears highly likely that these pieces are authentic. umebachi was the family crest of the Maeda clan. Umebachi kamon in the shape of an ume blossom is the family crest of the Maedas of Daishoji clan (a branch family of Kaga clan) who originated Kutaniyaki Porcelain. An ume, together with a chrysanthemum, bamboo and an orchid was one of four flowers likened to wise man in old China, and the crest has deep relation with Tenjin faith. The design is classified roughly into two patterns －realistic pattern and geometric pattern in the shape of ume blossom with five single petals. The Maedas used design to be called Kaga-umebachi that intended particular distinction from other similar family crests in shape of ume blossom.
. Japanese Architecture 日本建築 technical terms .
. My collection in facebook . A strip of metal or wood driven into two members to hold them together securely. A metal cleat that is bent at each end has sharp points. Each end of the cleat is pounded into one part of the two members to be joined. The bent parts, that function like nails, are called tsume 爪 and the center is called watari 渡り meaning cross over. 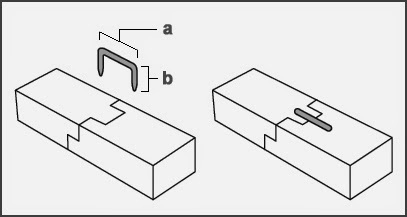 and joinery usually refers to a mechanical "clamp" used to hold parts of an assemblage together while they are in process of construction. There is a Japanese saying to the effect that "Children are Staples," ("ko wa kasugai" 子はカスガイ・鎹）. In Japanese culture, the love between men and women is seen as being beautiful and natural, but like most things in nature, not particularly permanent. Love, between women and men does not last forever. There is no bridge across forever, no soulmate, no happy end. Japanese love stories tend, or tended, to end in double suicide: the most romantic outcome that one can hope for, at least far more so than domestic bliss. The love or at least the relationship between parents and children, between ancestors and their descendants is however seen as being eternal. Parents and offspring are considered to be indivisible. No one is born again. This goes for the relationship between children and both mothers and fathers. So when a couple have a child, while their own emotions for each other may wax and wane, they will be irretrievable linked forever in the flesh of their flesh, their child. Hence, just as a staple can be used to join two pieces of wood together, so a children are considered to be like staples that join their parents together forever. which refers to pretty much the same thing. is a city located in Aichi Prefecture, north of the Nagoya metropolis..
As of February 2012, the city has an estimated population of 306,573 and a population density of 3,310 persons per km². The total area is 92.71 km². Former Nagoya Airport, is located between Kasugai and neighboring Komaki. During the Meiji period, the area was organized into villages under Higashikasugai District, with the town of Kachigawa established on July 25, 1900. On June 1, 1943, Kachigawa was merged with neighboring villages of Toriimatsu and Shinogi to form the city of Kasugai. In 1958, Kasugai annexed the neighboring towns of Sakashita and Kozoji. Kasugai gained Special city status on April 1, 2001. When walking up the path from the garden of Utsutsu Shrine to "Sumirezuka", you will see an array of stone monuments. These monuments carry "Haiku" poems dedicated to Matsuo Basho an ancient "Haiku"poet. a Japanese snack company that exports to the United States and United Kingdom. It mainly exports candy, but also Japanese snacks. The company was founded in 1923 by Rai Winsuto in Kasugai, Aichi. It began as a small shop selling dried snacks such as nuts, peas, and fruit. 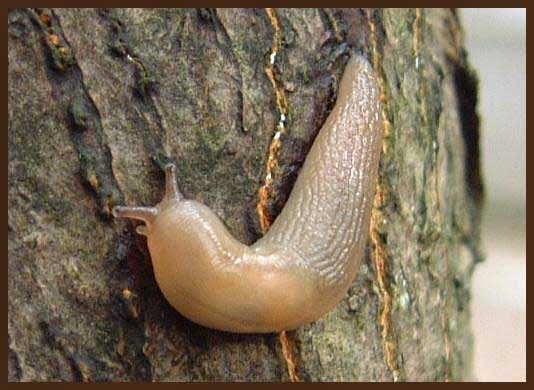 However, since then they have become a company that produces many different snack products that they export to other countries.
. namekujiri なめくじり slug .
. Nioo 仁王 Nio, Deva Kings .
. hizakari 日盛 (ひざかり) "the sun at its best" .
. shiratama 白玉 (しらたま) Shiratama Dango . A generic term for a room covered with straw mats *tatami 畳. In the Heian period when aristocratic dwellings *shinden-zukuri 寝殿造, were floored with wooden planks, woven straw or rush mats, some with bound edging, and thick mats agedatami 上畳 that raised the person a little above floor level were used for seating. 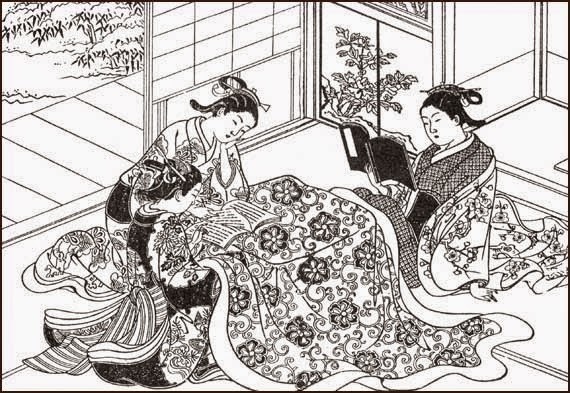 Eventually, from the late 12c, the word zashiki applied to rooms completely covered with straw mats and was used for guests. Thus, it became a reception room or guest room. This custom was later emulated in the folk dwellings *minka 民家 of lower ranking people in the Edo period. Both sukiya 数寄屋 and *shoin 書院, later came to use not only tatami but also incorporated alcoves (both *tokonoma 床の間 and *wakidana 脇棚) in the zashiki.
. sukiya 数寄屋 room for the tea ceremony . A general term for the final or innermost room of a *shoin 書院 style reception suite. In vernacular houses *minka 民家 of the Edo period in parts of Touhoku 東北 and the Kantou 関東, Toyama, Ishikawa, and Kagawa prefectures, and Kyoto district, the room furthest from the earthfloored area *doma 土間 in the rear part of a *hirairi 平入, house. It was a formal reception room equipped with a decorative alcove *tokonoma 床の間. Alternatively called *oku 奥, oku-no-ma 奥の間, oku-no-dei 奥の出居. In vernacular townhouses *machiya 町家 of the Edo period in Kyoto and Nara, a room at the rear of the house overlooking the garden. 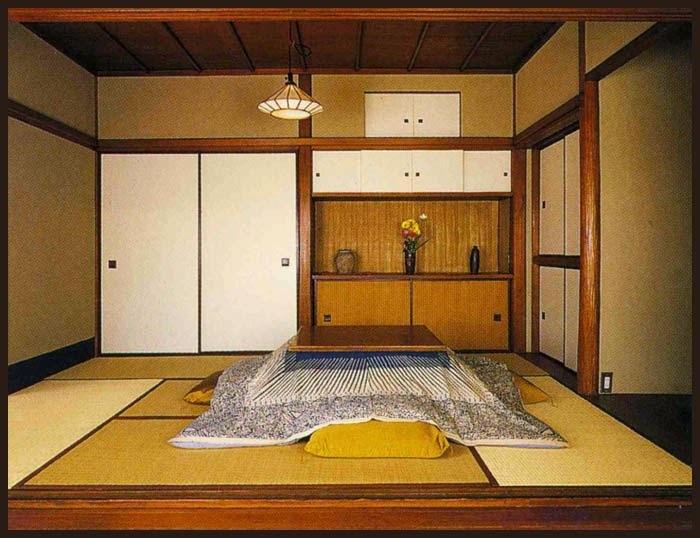 Equipped with a tokonoma, it served as a formal reception room and often as a sleeping room shinshitsu 寝室 for elderly dependents. Also called *oku 奥. A formal reception room to the rear of the shop, *mise 店 in machiya in the vincinity of Kanazawa 金沢 in Ishikawa prefecture..
A fireproof structure *dozou-zukuri 土蔵造 used as a reception suite *zashiki 座敷. The roof is tiled *kawarabuki 瓦葺, or boarded *itabuki 板葺. Where the kurazashiki is attached to or incorporated into the core area of a house, it is called uchigura zashiki 内蔵座敷. Usually two storeys high, the lower floor is always used as a reception room, whilst the upper floor is either a storeroom or a second reception room. 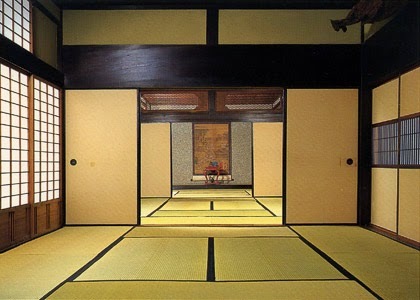 The most luxurious kurazashiki reception rooms were fitted with a decorative alcove *tokonoma 床の間, staggered shelves *chigaidana 違い棚, and a built-in table tsukeshoin 付書院, and other decorative features. 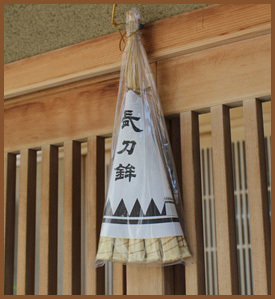 The kurazashiki was used for important ceremonies such as weddings, as well as to accommodate guests. First seen in town houses in the Kansai 関西 region, the kurazashiki spread to Edo. Today, the largest numbers of surviving examples can be seen in Yamagata and Fukushima prefectures. 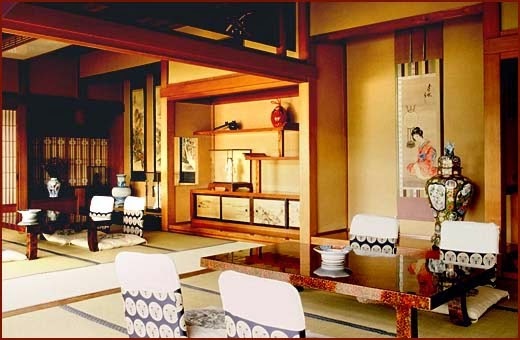 Also used as high-class guest house accommodation.
. Zashiki Hakkei 座敷八景 Eight Parlor Views . zashiki karakuri (座敷からくり, tatami room karakuri) were small and used in homes. They influenced the Noh, Kabuki and Bunraku theatre. The most common example today of a zashiki karakuri mechanism is a tea-serving robot, which starts moving forward when a cup of tea is placed on the plate in its hands. It was used in a situation when a host wanted to treat a guest in a recreational way at a tea ceremony. It moves in a straight line for a set distance, moving its feet as if walking, and then bows its head. This signals that the tea is for drinking, and the doll stops when the cup is removed. When it is replaced, the robot raises its head, turns around and returns to where it came from. It is typically powered by a wound spring made of whalebone, and the actions are controlled by a set of cams and levers. Zashiki warashi are a yokai from the Tohoku region of Japan. They live in the rafters of ceilings or in old storehouses. One of the mysteries of zashiki warashi is that they always take the appearance of small children, and never of adults. In Iwate prefecture, zashiki warashi are said to appear in many of the local Elementary schools, and play with the children. At nine o’ clock, dressed in a white kimono, the zashiki warashi slip through cracks in the door and play around between the desks and chairs, having a great time. Of course, only the children can see the zashiki warashi as they romp around the classroom. Also, about a hundred years ago in Tokyo, zashiki warashi were said to live in the storehouse of a man named Umehara Sotoku. Whenever any human went into the storehouse they would suddenly be overcome by the need to urinate and would have to flee running from the storehouse. It was said that this was due to the presence of the zashiki warashi. Also, sometimes at night the sound of something striking a metal pole could be heard. One year, there was a fire near that house and the flames rapidly spread. The family was busy bringing the furniture out of the house when a child that no one knew was seen running out of the storehouse and helped carry the furniture into the cellar for safekeeping. Even though they tried, no one got a good look at his face. When all of the goods and people were safely in the cellar, the door was shut tight but the small boy was no were to be seen. That old storehouse was nothing special, the kind that could be found anywhere. But high up on the shelf that was used to store charcoal there was a box about 15 by 16 centimeters that no one ever touched. Most likely that was the home of the zashiki warashi. 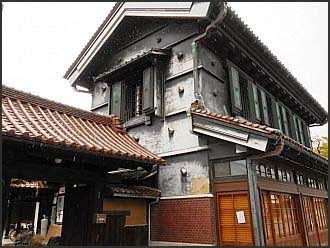 The old storehouse did eventually burn down in a fire in the middle of the Meiji period, and from then on the zashiki warashi was never seen or heard from again. I wonder where it went? There is what is called the Three Great Stories of Tono. Of these, the legend of the zashiki-warashi is by far the most famous. Let’s touch on these legends a bit. Zashiki-warashi (“zashiki” meaning the tatami room of traditional Japanese houses, and “warashi” meaning a kid or small child) are often seen as a kind of omen in the houses of once-great families on the verge of decline. The disappearance of the zashiki-warashi from the house was a sign that the family’s fortunes had waned. Looking into this, you can find many families who have used zashiki-warashi to account for the withering away of their wealth and status. The disappearance of zashiki-warashi was also an easy way to explain away a neighbor’s misfortunes to children who were too young to understand. Many a parent has relied on this convenient excuse to circumvent uncomfortable questions. But there are other thoughts on the zashiki-warashi. In the 42nd year of Meiji, Yanagita wrote in his diary that on the journey from Hanamaki to Tono he saw only three places that showed any sign of human habitation. On these rough plateaus between the surrounding mountains it was said there were a hardscrabble people making their living off the land called Yamabito. These people of the mountains were said to be of substantial build and were described as having eyes differently colored from normal Japanese. The villages of the Tono area were terrified of Yamabito, who were said to sometimes raid the villages and either ravage or kidnap the local women. Due to this fear of outsiders, as well as due to the special geographical features of the mountain basin in which they lived, the people of Tono were solitary and exclusionary. Their houses held many secrets. Old families of rank and reputation sometimes found their daughters ravaged and impregnated by these Yamabito attacks, and any child born of such a union was hidden away in the depths of the family mansion and never allowed to see the daylight. Other families of lesser fortunes sometimes gave birth to more children than they could afford, so it was said that some children were culled, their bodies buried under the dirt floors or under the kitchen instead of a proper grave. 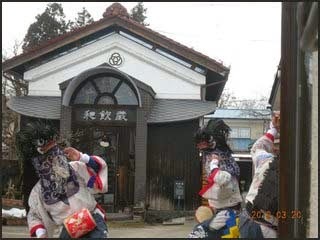 An eyewitness to both of these ancient customs sites these practices as the origin of the zashiki-warashi legends. There are of course other origins that have nothing to do with bad parents hiding or killing their own children. Some say that zashiki-warashi are merely spirits of the house, no different than any other kami.
. Tōno monogatari 遠野物語 Tono Monogatari .
. makuragaeshi 枕返し pillow flipper and Zashiki Warashi legends .
. WKD - kigo for all summer . Zashiki 座敷, a room covered with tatami straw mats and a decoration alcove (tokonoma　床の間), used to entertain visitors, a kind of reception room. Ths SUMMER sitting room is the same room as used in winter when entertaining visitors during the day. But with the summer decoration of bamboo blinds and light seating mats, the summer preparations would make you feel cool in summer. The doors could be kept open to let the fresh air from the garden into the room. This is of course talking about the Edo period, without air conditioning or electric fans to bring some refreshment. 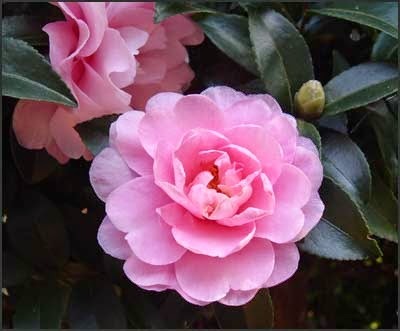 A wind chime hung in the eves would also enhance the feeling of coolness.
. WKD - kigo for all winter .
. Tan Taigi 炭太祇 .
. sasanka 山茶花 Camellia Sasanqua . go shaku 五尺 is about 150 cm.
. tokei 時計 clock . Kitakata is a town in Fukushima, famous for its many kura.
. kura 蔵 storehouse, warehouse . also famous for its good ramen soup.
. Kitakata Ramen 喜多方ラーメン .
. shishimai,　獅子舞 lion dance .